Celebrating the eminent career of Dr. Earl W. Davie, the annual symposium honours the achievements of a pivotal figure in medicine whose pioneering discovery of the waterfall sequence of coagulation has enabled research that led to effective diagnosis, treatment, and management strategies for numerous blood disorders. Now, Professor Emeritus at the University of Washington, Dr. Davie continues to share his passion for science and research, joining local and international researchers, students, healthcare professionals, patients, and representatives from industry, at the 11th annual Earl Davie Symposium on November 16, at the Vancouver Sheraton Wall Center. Dr. Earl Davie (centre left) and Dr. Eddy Fischer (centre right) with symposium speakers. This interdisciplinary symposium gathered experts in topics ranging from hemostasis-thrombosis, immunology, and infectious diseases, to vascular biology and cardiovascular research. The director of the CBR, Dr. Ed Conway, gave the opening remarks to introduce Dr. Davie’s career. Born in Tacoma, Washington in 1927, Dr. Earl Davie started his academic career at the University of Washington. After completing his PhD with Dr. Hans Neurath, Dr. Davie moved on to work at Case Western Reserve University School of Medicine. Through his interactions with Dr. Oscar Ratnoff, Dr. Davie’s career took off as he began to characterize a number of coagulation proteins. In 1964, in what Dr. Conway described as “a foundational discovery that stands the test of time,” Dr. Davie published a proposal of the famous “waterfall sequence” for blood clotting, marking a significant advance in our knowledge of coagulation that would pave the way for many of the research pursuits highlighted throughout the symposium. The first talk of the day was given by keynote speaker, Dr. Katherine High, on her group’s innovative and exciting strategies towards making gene therapy a viable option for patients with hemophilia. After giving an overview of investigational efforts in adeno-associated vectors (AAV) for hemophilia B gene therapy, Dr. High began to describe some of the obstacles. During clinical trials, vector, AAV-mediated gene delivery of FIX yielded high levels, but the effect was only transient, due to a complex interplay with the immune system. With persistent efforts, these challenges are being overcome and with the use of highly efficient vectors and immune modulation, a majority of patients have retained factor levels upwards of 30% over 18 months. 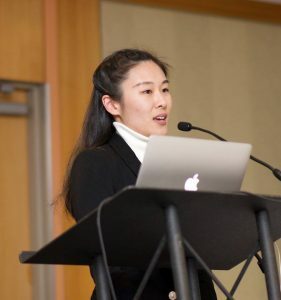 Continuing on the topic of hemophilia, Dr. Carol Miao, a former trainee with Dr. Davie, presented a talk on novel approaches in hemophilia treatment using ultrasound mediated gene delivery via lentivirus. The Miao group has developed FVIII antiviral vectors that can be delivered intraosseously to transduce hematopoietic stem cells in the bone marrow to produce platelets that can act as a vehicle for factor delivery. Their findings demonstrate that platelets may be an ideal vehicle, as platelet activation is localized at the site of bleeding. Clinical presentations followed, focusing on the dangers of living with “mild” forms of hemophilia and the misconceptions associated with these disorders. Mr. George Stephenson, an 83 year old patient with “mild” hemophilia, underlined through life experiences that “mild” is truly “sneaky” and can be serious, requiring vigilance in medical care. Dr. Drew Bowie reinforced these concerns from a physician perspective, highlighting the need for early recognition and intervention to reduce morbidity and mortality. Dr. Gow Arepally from Duke University, described the role of complement activation in heparin-induced thrombocytopenia (HIT). Her research group discovered that the development of HIT antibodies is dependent on complement activation, revealing new understanding of the immunogenicity of PF4/heparin complexes that may yield novel therapeutic strategies. After a brief coffee interlude, attention shifted to sepsis and the new strategies to combat this global medical emergency. Dr. Bas Surewaard from the University of Calgary gave an intriguing talk about the protective effects of neutralizing Staphylococcus aureus alpha toxin (H1a). Dr. Patricia Liaw from McMaster University then shared recent advances in targeting cell free DNA (cfDNA) as an approach to treating sepsis. The morning session ended with the signature 30-second “shotgun” talks by undergraduate, graduate and postdoctoral trainees. Dr. Eddy Fischer, a 1992 Nobel Laureate, led the afternoon with a reprisal of his presentation from 4 years ago, with a fascinating overview of how an in-depth analysis of the “archaic” methods used to isolate glycogen phosphorylase led to the identification of the components necessary for reverse phosphorylation. The second keynote, Dr. James Morrissey from the University of Michigan, described his groundbreaking work in determining the role of platelet polyphosphate in triggering coagulation and preventing fibrinolysis though its interaction with multiple steps in the “waterfall sequence”. Dr. Morrissey is a frequent visitor to the CBR, with several collaborations that will hopefully lead to the development of safer anti-thrombotic therapies. Several PhD students from UBC then had an opportunity to give short talks. Bryan Lin (Pryzdial Lab) reported how some viruses promote coagulation through incorporation of tissue factor on their envelope. Beverlie Baquir (Hancock Lab) described a combined mass spectrometry and flow cytometry method for identifying and isolating specific subpopulations of immune cells present during early sepsis. James Baylis (Kastrup Lab) described a new strategy for treating severe bleeding during trauma, using self-propelled microparticles incorporating thrombin and tranexamic acid. Sheila Walker and her daughter, Holly, shared their inspirational stories of a familial thrombotic disorder. Holly suffered a thrombotic episode that affected her ability to control emotions. In spite of this, she is facing the challenge, continuing to fulfil her passions: skiing, climbing, and helping others. A first for an Earl Davie Symposium, the CBR’s own Dr. Conway finally took the stage to give an intriguing presentation of work done by his lab to investigate the link between obesity and thrombosis. His research group has revealed that CD248 may be a novel all-in-one therapeutic target for treating obesity and venous thrombosis. Dr. Rodney Camire, from the University of Pennsylvania, presented his intriguing and creative therapeutic strategies, using bioengineered Factor Xa to treat bleeding disorders in a more controlled fashion. It will be fascinating to follow the outcomes of the pilot studies planned for patients with major intracerebral bleeds. Finally, we were treated to a “fusion” of biology and engineering, when Dr. Abhishek Jain from Texas A&M College of Engineering, introduced the “Organ-on-a-chip.” His microfluidic devices that mimic the in vivo vasculature hold potential of replacing mouse models to evaluate new drugs as well as mechanisms underlying hemostasis, thrombosis and inflammation. Throughout the day, there were all sorts of amazing posters presented by CBR members at all ages, with judging done by more senior members. 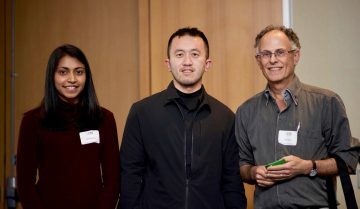 Award winners for best poster were Xining (Linda) Yang, Quan Guo, and Enoli De Silva. Special thanks to Dr. Ed Pryzdial, Mira Milutinovic, and Julie Kora, and to the many others who made this event a success. And of course, to our sponsors. Pfizer, Novo Nordisk, Shire, Bioverativ, Canadian Blood Services, CSL Behring, Bayer-UBC Bleeding Disorders Collaboratory, Octapharma, Grifols, Sheldon Naiman-Linda Vickers Endowment Fund, Alexion, New England Biolabs, Stago. To see recordings and photos from the event, visit the CBR website. 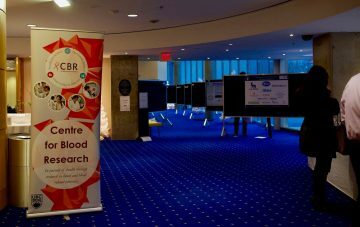 To read the Canadian Blood Services’ Research, Education and Discovery (RED) blog post about the symposium click here. See you at the 12th Annual Earl Davie Symposium on November 15, 2018! !